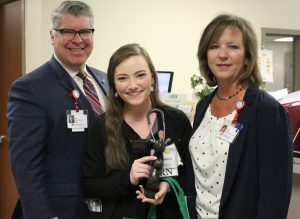 DAISY recipient Ashley with hospital president Neil Heatherly and chief nursing officer Lynn Cagle. A nurse at Parkwest Medical Center were honored today with The DAISY Award for Extraordinary Nurses. The award is part of the DAISY Foundation’s program to recognize the super-human efforts nurses perform every day. The DAISY Award was established in 1999 by the family of a patient who had received extraordinary care and compassion from his nurses during his final days. Parkwest’s DAISY honorees for March is Ashley Adams, RN. Ashley works on 2 Montvue (Heart/Lung/Vascular Med-Surg Unit), and has been a nurse at Parkwest for almost a year. She was nominated by a patient, Linda B.
Linda praised Ashley for her compassionate care, “She was the sweetest and kindest and I could use all of this paper saying nice things about her. She came in about 6:45 with another nurse that was taking over. As she was leaving she said she would come by before she left to say goodbye because she wasn’t working the next day and I was being discharged. I wasn’t expecting her to come by after a hard day of working. 12 hours is a long day. At 9 p.m. my door opened and there was Ashley, coat on, ready to leave, coming by to say she wanted to say bye and hoped all went well when I got home. Tears are in my eyes now remembering that sweet time she spent with me. When she left my husband and I were talking about how special she was. About 7-10 minutes she returned. She tried to find out if I was getting solid food for breakfast. She knew I was concerned that solids might make me sick. She had to be going out the door on her way home, tired, but thinking of me to turn around and come back. 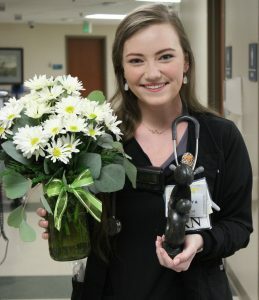 The DAISY Committee presented Ashley with a pin, a certificate, daisies, The Healer’s Touch sculpture, and cinnamon rolls for her entire department to share. Congratulations to Ashley! We appreciate her passion for nursing, and her commitment to always putting her patients first! 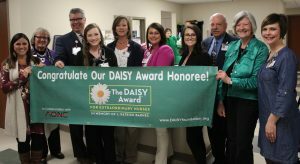 Nurses may be nominated by patients, families, and colleagues, and they are chosen by a committee at Parkwest Medical Center to receive The DAISY Award. To nominate a nurse today visit here.